Featuring a giant, open world – about 30 times larger than that of The Witcher 2 – that you can explore on foot, on horseback or even by boat, The Witcher 3 puts you for the last time into the stout boots of Geralt of Rivia, a white-haired monster hunter for hire who this time around, on top of all the inevitable slaying of vicious beasts, is in search of a child from an ancient prophecy. With over 200 hours of gameplay if you're determined to do absolutely everything along the way, it's a massive and epic game that'll take its toll on even the most powerful gaming rig. To help things along, developer CD Projekt RED is using a brand new version of its REDengine. REDengine 3 is a 64-bit beast, built to create the best possible graphic quality, using high dynamic range rendering to generate its rich landscapes and their inhabitants, who also benefit from improved facial animation and an advanced dialogue mimic system, which means that when they speak their mouths should move to match what's being said. REDengine 3 also supports volumetric effects for improved rendering of clouds, fog and smoke, as well as ultra-high resolution textures, and its renderer can be used to create an impressive array of cinematic effects. CD Projekt RED’s REDengine 3 has also been revamped with the implementation of an advanced new streaming load system, which allows The Witcher 3: Wild Hunt to seamlessly switch from smaller environments to sprawling open settings without constantly interrupting gameplay with immersion-shattering loading screens. The upgraded game engine accomplishes this by silently loading up new environments in the background during gameplay. If that's not enough, CD Projekt RED has been working with Nvidia to integrate its GameWorks technology into The Witcher 3. The GameWorks platform consists of a robust suite of tools and graphics technologies designed to help developers build rich and immersive experiences, and it's built and maintained by over 300 visual effects engineers who develop libraries, tools and samples, and who also work alongside the developers to help them implement GameWorks features into their games. Perhaps the most exciting GameWorks feature that you're going to notice in The Witcher 3 is HairWorks. Now, realistic hair and fur simulation and rendering – which is what HairWorks does – may not sound especially enthralling, but it's going to make one hell of a difference to what you see. 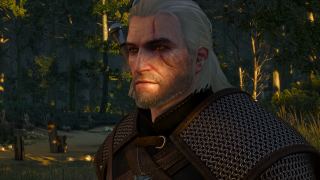 Originating from multiple simulation and rendering technologies that Nvidia has developed in the past, HairWorks most noticeably gives Geralt's trademark white mane extra swish and flow, with the added bonus that throughout the game his beard will keep on growing, and you can either let it do its thing and end up going full Gandalf, or you can stop off at barbers' along the way to keep it in trim. Geralt's trusty horse also gets a HairWorks makeover, as do many of the monsters, who'll feature thousands of strands of dynamic tessellated hair, creating the most realistic fur simulation you've ever seen in-game. The world of Witcher 3 gets an extra layer of realism thanks to GameWorks' HBAO+, which creates high quality Ambient Occlusion shadows on every character, object, surface and piece of foliage in the game, with more accurate and realistic results than other AO techniques. It all adds up to a more vivid world in which every detail stands out in a natural, photographic way. Other ways the development team at CD Projekt RED has brought The Witcher 3’s rich fantasy world to life is by implementing post-process anti-aliasing, a technology that dramatically reduces jagged edges in objects in the environment, bloom, which is a post-processing effect that intensifies bright light in the game and how it is realistically cast on various surfaces, depth-of-field, blur and velocity-based motion blur among a whole host of other high-end graphics effects. Check out the video above for a glimpse at the GameWorks technologies utilized in The Witcher 3. Finally, The Witcher 3 uses Nvidia's PhysX effects throughout the game. PhysX Clothing is used to ensure that all the characters' clothes – not to mention things like the sails on ships and even horse tails – move in the most realistic way possible, while PhysX Destruction does exactly what you'd expect: it allows objects and scenery to be destroyed realistically and without any noticeable performance hit. If you don't have an Nvidia GPU, don't worry that you're going to miss out; all this tech uses DirectX 11 and will happily work on AMD cards as well. It's worth noting, though, that if you're in the market for a new GPU to meet The Witcher 3's hefty system requirements, buying a GeForce GTX 960 or better will also net you code to download the game for free.